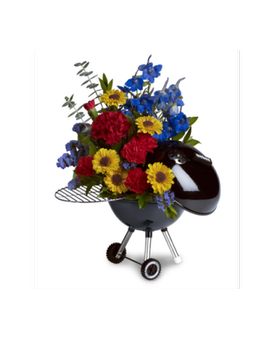 Celebrate your favorite grill master's day, or accent any summer gathering with this vibrant bouquet of fresh summer blooms designed in a keepsake replica of a classic Weber grill. Featured flowers include carnations, delphinium, daisies, statice or similar fresh favorites. Perfect for dads, husbands, boyfriends, picnics and casual entertaining!